The youngest of four children, Fr. Santiago Raudes was born and raised in Managua, Nicaragua. His parents, Horacio and Esperanza, and a great aunt were very influential in helping him to develop his relationship with God. In 1981 Fr. Raudes left Nicaragua to join his brothers who were living in Sacramento. He graduated from Luther Burbank high school in 1983. Although he considered the priesthood after graduation, he initially chose a different path. Then, shortly after reading a book about the alleged apparitions of Mary at Medjugorje, Bosnia-Herzegovina, Fr. Raudes reconsidered the priesthood. He dreamed that he was standing on a mountaintop with a man dressed in a white tunic, whose face was hidden by a hood. The two walked together down the mountain to where a mass of people was waiting. The man in the tunic put something in his hand, and began passing it out to the people. When he woke, Fr. Raudes believed he had been given a sign from God. As a member of Immaculate Conception Parish in Sacramento, Fr. Raudes was active in several prayer groups in his church and at St. Ignatius Parish. He served as a catechist at a migrant workers’ camp in Davis. In 1994, Fr. Raudes entered Mount Angel Seminary in Oregon where he obtained a bachelor’s degree in philosophy. 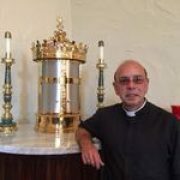 In 1998, he entered St. Patrick Seminary in Menlo Park to begin theological studies. A year later, he was sent to the North American College in Rome, where in 2001 he was ordained a transitional deacon at St. Peter’s Basilica in Rome. Bishop William K Weigand ordained Fr. Raudes to the priesthood on August 26, 2002 in the Cathedral of the Blessed Sacrament. He then returned to the North American College for a year to complete studies in canon law. In the summer of 2003 Fr. Raudes was assigned to Holy Family Church in Sacramento and served part-time in the diocesan tribunal. In 2006, Bishop Weigand assigned him full time to be his personal secretary and vice-chancellor of the diocese. Additionally, he was active with the Hispanic community at Immaculate Conception. A year later, he was also appointed Adjutant Judicial Vicar. Bishop Soto assigned Fr. Raudes to St. Robert Parish, Sacramento, in 2011 where he served until 2015. Afterwards he was transferred to Holy Family Parish, Citrus Heights. He began his assignment at St Joseph’s Clarksburg on February 1, 2017.